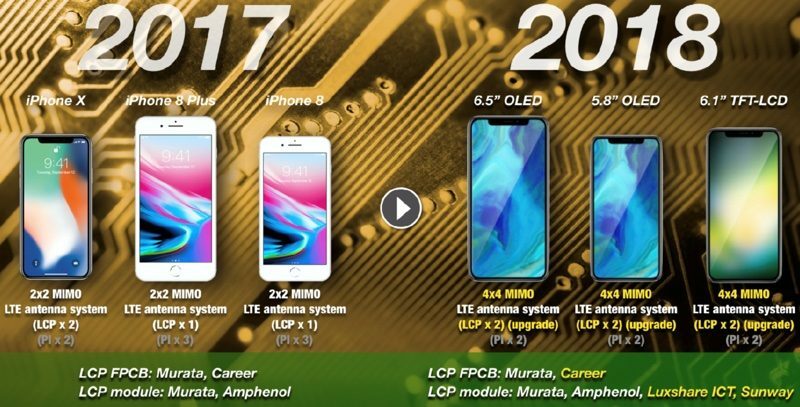 Apple's upcoming 2018 iPhones will feature upgraded liquid crystal polymer (LCP) antenna modules that will contribute to faster LTE transmission speeds, KGI Securities analyst Ming-Chi Kuo said tonight in a note that was sent out to investors. Kuo says new iPhone models will use at least two LCP LTE antenna modules, much like the iPhone X, but with improvements to support 4x4 MIMO standards. Antenna design upgrade a key factor in anticipated boost to LTE transmission speed in new 2H18F iPhone models. As a LTE antenna FPCB material, LCP is superior to PI in properties related to high-frequency, thermal performance and moisture resistance. We predict 2H18 new iPhones will be equipped with two LCP LTE antenna modules same as iPhone X or more, but with higher specs to support 4x4 MIMO standards. Last week, Kuo said Apple is expected to use Intel XMM 7560 and Qualcomm Snapdragon X20 modems in its next-generation iOS devices, enabling faster LTE transmission speeds. Both of those chips support the previously mentioned 4x4 MIMO technology, compared to 2x2 MIMO in the current iPhone models. 4x4 MIMO, or Multiple-Input Multiple-Output has the potential to significantly improve LTE transmission speeds by increasing the number of data paths between a cellular tower and an iOS device to four. In previous notes, Kuo has said Apple is working on a total of three iPhones for 2018, including a 5.8-inch OLED model that's similar to the current iPhone X, a 6.5-inch OLED model that can be thought of as a sort of "iPhone X Plus," and a new 6.1-inch LCD model, designed to sell at a lower price point. All three, says Kuo, will include edge-to-edge iPhone X-style displays and Face ID support. Kuo believes Apple will ship an estimated 100 to 120 million iPhone units in the second half of 2018, something he has previously said will fuel an upgrade "supercycle" during the year. I have zero issue about notch. It's going to be there until Apple finds a way to place the Camera and sensors with in the display. People keep whining about the notch; but I'd take the notch over those giant top and bottom bezels on the old iPhone any day. A bunch of wasted space. Anytime I see other iPhones now I'm just reminded of how archaic that design is. iPhone X has been a great experience for me. Looking forward to 6.5 inch iPhone. It makes very little sense that they needed to utilize the area on either side of the notch for anything other than the time, wifi/LTE indicators and battery level. The fact that apps have to wrap around the notch is just bad design. When holding it horizontally you just make it black and it vanishes and vertical you leave the time and other indicators there. Or you do it the way samsung did. Just leave a very thin bezel and that would be the end of it. I think samsung's design looks a lot better. If only it had iOS on it. Ming say, Ming says... yawn. If Ming said he wiped his backside last night it'd be quoted here. What they gonna call this? An iPhone 8S? iPhone 9 iPhone 11? iPhone X squared? iPhone X2? iPhone XI? I’m confused!? When will these signals become too strong to be healthy ? I cringe every time I see the notch. Such bad design. Apple give us a smaller OLED please!